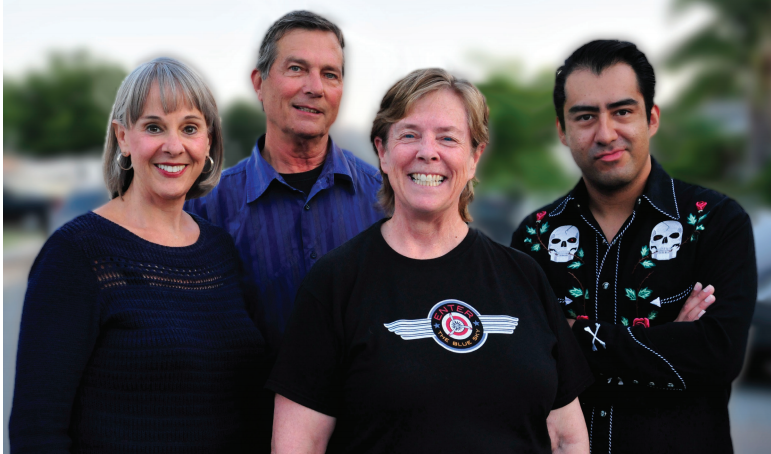 ENTER THE BLUE SKY: Karen Childress-Evans (left to right) John Seever, Sande Lollis and Alberto Gonzalez. With its roots in San Diego’s Hillcrest and North Park, a lively and talented band—aptly named Enter the Blue Sky is drawing attention to itself and because of the group’s excellent performances is no doubt destined for more than neighborhood venues. Like all of us in life we dream of that day when the world recognizes our talent. Case in point: Enter the Blue Sky is a group worthy of paying attention to. Catch them July 14, from 6 to 8 pm in University Heights as they perform in the Summer in the Park Concert Series at Trolley Barn Park (Adams and Florida Streets). Paced by vocalist, lead Sandé Lollis is a powerhouse of energy and melody; she is backed by three talented and passionate instrumentalists. Karen Childress-Evans, on viola, brings achingly beautiful tones and a classic sensibility to the band; Alberto González, on upright bass, has an innate sense of groove, with a solid beat and imaginative fills; and John Seever, on harmonica, underlays dreamy chords and explosive leads adding depth to the band’s unique sound. Together, Enter the Blue Sky combines decades of experience and individual talent to present a new and vibrant musical force to the local music scene. More on Enter the Blue Sky (on group’s website). While some selections from this four-piece all original Americana band have a forward up-tempo, the majority of their sound is a composite of poetic, smooth, original and unique rock melodies supported by warm harmonies and textures. The songs are lyrically- and vocally-driven, backed by exciting instrumentalists in an atypical yet harmonious blend. Four-piece all original Americana band, Enter the Blue Sky, has been evolving and pioneering their way through gig after gig, gaining momentum with no end in sight. While some selections have a forward up-tempo, the majority of their sound is a composite of poetic, smooth, original and unique rock melodies supported by warm harmonies and textures. The songs are lyrically- and vocally-driven, backed by exciting instrumentalists in an atypical yet harmonious blend. An award-winning vocalist, Sandé Lollis has played locally in several bands over the years. She writes all songs for the band; her lyrics are thoughtful with melodies that are hard to forget. As lead vocalist for Enter the Blue Sky, Sandé is a powerhouse of energy and melodic bliss. Not a back burner type, Karen Childress-Evans on viola, jumps in with both feet and keeps smiling. A refreshing and innovative team player, she brings achingly beautiful tones and a classic sensibility to the project. Possessing an innate sense of groove, Alberto González, the band's bass player, believes each song tells him what and how to play. He is assertive, playful, and earnest, with a solid beat and imaginative fills. John Seever plays harmonica for the band, his underlayment of dreamy chords and explosive leads adds depth to the band's unique sound. Each member of Enter the Blue Sky brings years of experience and individual talent together to blend into a new and vibrant musical force on the scene. Summer in North Park is highlighted by free concerts organized by the North Park Community Assn. This year a trio of concerts will be held at the usual venue: Bird Park, Upas and Pershing Drive.